J. G. Keulemans delt. & lith. [Plate XIV, 1888]. Shows two long-tailed cuckoos, the adult on a branch to the left, the chick on the ground receiving a worm from a Grey Warbler perched on a branch above it. Group: Urodynamis taitensis; Comments: Listed as Eudynamis taitensis. Behavior: juvenile fed by Grey Warbler; Life Cycle Stage: juvenile and adult. The Long-tailed Cuckoo belongs to the subfamily Cuculinae which includes the Old World parasitic cuckoos. This species lays the eggs in the nests of the Mohouidae, and these tiny birds raise the young cuckoos. The Long-tailed Cuckoo is a long-distance migrant. It breeds in New Zealand, but after the breeding season, it performs a remarkable overwater migration to winter in a vast arc of Pacific islands. It migrates at night while uttering loud shrill notes, giving the bird the name of “screamer”. 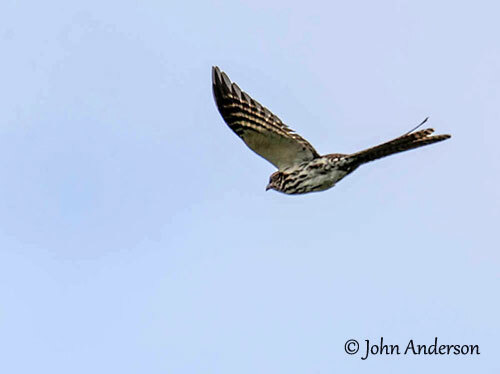 The adult male has rufous-barred brown upperparts, including the wings and the long tail, as long as its body. The underparts are white to rufous and streaked black from chin to vent. The streaks are usually thick. The head is blackish streaked rufous. There is a conspicuous white supercilium, and we can see a dark moustachial stripe contrasting with the white lower cheek. The bill is yellow to horn-coloured. The eyes are dark brown. Legs and feet are greyish. Both sexes are similar, but some birds can be more rufous and are often females. The juvenile has dark brown, heavily spotted creamy-white upperparts. The underparts are more or less tinged pale brownish, with thinner streaks than in adults. The dark tail is barred whitish. 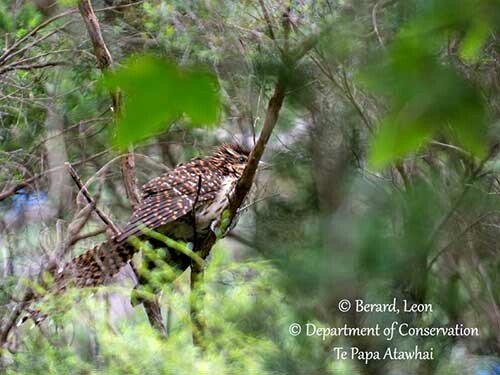 The Long-tailed Cuckoo breeds in New Zealand where it is present all year round, except during winter, as well for breeding, or on passage between breeding locations. The breeding range includes New Zealand, Great and Little Barrier Islands, Kapiti Island and Stewart Island. During winter, it is found in an arc of Pacific islands extending over more than 10,000 kilometres, from Micronesia in the west, to Henderson Island in the east. The Long-tailed Cuckoo usually occurs in extensive native or exotic forest or scrub, where there are its usual host species. The birds on passage occur mainly in farmland and even in urban areas. The Long-tailed Cuckoo’s main call is a loud, shrill whistle which lasts about two seconds “wheet wheet”. This cry may vary in pitch and interval, and is sometimes followed by other notes, several strident “pe-pe-pe-pe-pe-pe”. If two birds are circling in the air, this whistle is repeated quickly, up to four “wheet” per second. These calls can be given by night or by day, including during the migration. The Long-tailed Cuckoo feeds mainly on invertebrates such as large insects (cicadas, weta and stick insects). It also takes small vertebrates such as lizards, nestlings and eggs of other birds. It may occasionally feed on fruit and berries. But this species is also known as an aggressive predator, and is able to kill adult birds such as sparrows, bellbirds or thrushes. The courtship behaviour of this species is unknown, but we can suggest that it is similar to other Cuculidae species. They spread and raise the long tail in sexual display. Some parts of this behaviour have been recorded in Old World parasitic cuckoos. The plumage pattern is probably used during the displays. Courtship feeding from male to female may occur too. The female lays one egg per nest of small passerines such as Mohouidae. But prior to the laying, she watches the future hosts from a concealed perch, and could even visit the nest while the owners are away for feeding. The Long-tailed Cuckoo is a long-distance migrant, moving from New Zealand to Melanesia, Micronesia and Polynesia where it remains from May to September. The adults come back to their breeding locations in October and leave them in January/February. They migrate by night while calling loudly. Immature birds depart later than adults. 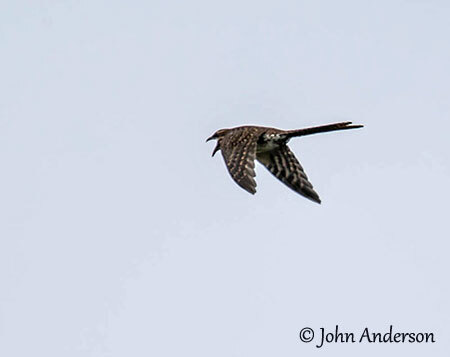 The Long-tailed Cuckoo in flight may resemble a falcon, and it is often mobbed by smaller bird species for this reason. The laying occurs mostly in November and December. 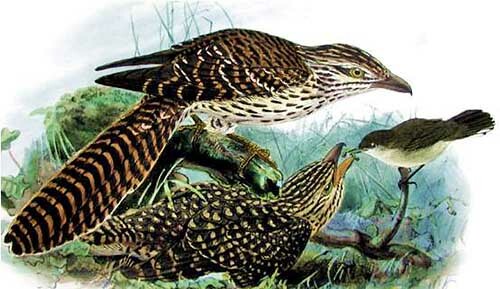 The eggs are laid in the nests of the three Mohouidae, including the Yellowhead, the Whitehead and the Brown Creeper or Pipipi. 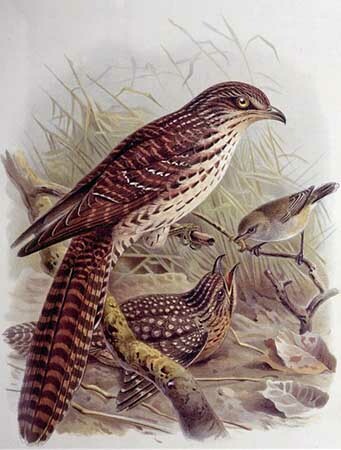 The adult cuckoo does not take part in nesting duties. The cuckoo’s eggs are whitish with dark markings. The nestling ejects eggs or/and chicks from the host’s nest. The cuckoo chick is fed by its foster parents after about 16 days of incubation. The young cuckoo fledges three weeks after hatching, but it is still depending on foster parents and their helpers for at least one month. They migrate north in April-May. The Long-tailed Cuckoo has probably been affected by the decline of Yellowhead’s population. The clearance of the subtropical rainforest in some parts of the wintering range could have an impact on this species too. The numbers are unknown but in spite of probable decline, the Long-tailed Cuckoo has large range and it is currently evaluated as Least Concern. In New Zealand, it is listed as Nationally Uncommon.